AIBA Youth World Championships bronze medallist, 19-year-old Kyrgyz Islomzhon Dalibaev moved up a weight division because of Boimurodov's hegemony at the welterweight class. The new Kyrgyz middleweight fighter got revenge for his compatriots' early defeats and triumph to Southeast Asian Games winner, Malaysia's Muhamad Haron by 14:6. Cayman Islands' Kendall Samuel Ebanks had a strong opponent in Baku. As expected he was eliminated by former AIBA Junior World Champion and Beijing Olympian, Moroccan Mahdi Ouatine by 21:5 in the lightweight class. AIBA 'Road to Baku' boxer and Pan-American Games Qualification Tournament bronze medallist, Bolivian Jose Alfredo Roca was disqualified on his opening contest thus European Championships quarter-finalist, Latvian Artjoms Ramlavs advanced to the next preliminary stage. Southeast Asian Games bronze medallist, Cambodian Ratha Svay briefly tried to beat Turkmenistan's new National Champion, 18-year-old talented Murad Pazzyyev. After the first three minutes the Cambodian boxer was keeping his dreams alive but the Turkmen teenager turned up the heat and won the contest by 19:9. Gambia's young AIBA 'Road to Baku' member, Ensa Jammeh was only participating in his third international boxing competition and was overwhelmed by AIBA Youth World Championships quarter-finalist, 20-year-old Dominican Republic's Wellington Arias by 20:2. Asian Championships competitor, 22-year-old Sri Lankan Nuwan Thennakoon had a close contest against Grand Prix Usti nad Labem silver medallist, Czech Miroslav Serban. But despite his efforts, the European boxer advanced to the last 32. 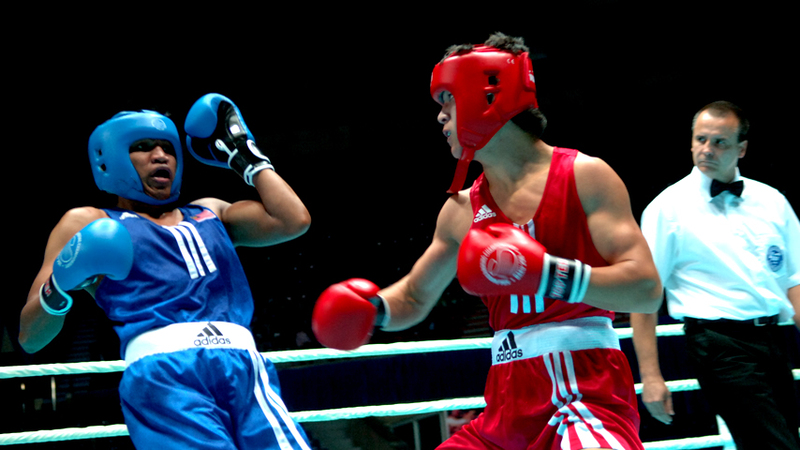 AIBA 'Road to Baku' member and Central American Games winner, Salvadorian Jose Mario Bernal was defeated by Youth Olympic Games bronze medallist, 18-year-old Hungarian Zoltan Harcsa by 22:8 in the middleweight class. African Zonal Champion, Ghanaian Emmanuel Ayaa Quarshie was stopped in the second round of his contest against Austria's only boxer in Baku, Arbi Chakaev when the European was leading by 18:5. Another African middleweight boxer, Senegal's last hope Mamadou Fall was defeated by Brazil's Esquiva Falcao by a large margin of points. Jamaica's UK based middleweight boxer, Reece Shagourie increased his knowledge at the training camp. It was nearly enough for him to beat National Olympiad winner, Mexican Juan Mercado. The Mexican competitor saved one point from his advantage until the final gong. Commonwealth Games competitor, Keithland King has been boxing in Barbados but represents Saint Vincent & Grenadines at the international level. The great Caribbean prospect had not enough time to show his knowledge because the referee stopped his contest just before the end of the first round. European Championships bronze medallist, Bulgarian Mladen Manev advances to the last 32. African Zonal Champion, Swaziland's veteran Musa Ngozo had no chance to beat European Champion and Seed No.2, Russian Artem Chebotarev. Saint Lucia's Arthur Langelier tried his best but Slovakia's Tibor Varga was too strong for him.